After a combined sewer overflow detention system was installed for the City of Monticello, Indiana, innovation was the only thing overflowing. Evidence of this is that this project is a recipient of the Indiana ACEC 2012 Engineering Excellence Honor Award. Nestled between Lake Shafer and Lake Freeman in northcentral Indiana, the city of Monticello is a Midwest summer vacation destination. The City has 5,400 year-round residents and operates a combined sewer collection system and Class II wastewater treatment plant with a design average flow of 1.1 MGD and peak capacity of 2.4 MGD. This system has six combined sewer overflow (CSO) outfalls that discharge to the Tippecanoe River and the downstream Lake Freeman. To comply with the federal Clean Water Act, the City’s long-term control plan (LTCP) included the reduction and elimination of CSOs. The Bryan’s Lift Station Improvements project was created to increase the lift station’s pumping capacity to 2.5 MGD and provide 500,000 gallons of detention. Bryan’s Lift Station originally was constructed in the 1950s and served combined sanitary and storm sewers. During peak water events, the lift station was overwhelmed and unable to handle the full flow resulting combined sewer overflow events. With approximately one million dollars in grant funding from the Indiana Office of Community and Rural Affairs, the first phase was able to proceed ahead of schedule. The site location presented unique challenges of limited space, a high water table and tight hydraulic limitations on the existing sewer systems. Further, property owners directly uphill of the site were concerned with maintaining their aesthetic views of the scenic Tippecanoe River. With the site layout challenges and its visible public location, traditional storage structure options quickly were eliminated. Open-concrete tanks would be difficult and expensive to build onsite. Steel tanks would have required an additional pump station to convey the incoming wet weather flows to the storage structures. A large-diameter tunnel did not appear financially or geographically practical. With sewer pipe technology innovations, creation of a steel reinforced polyethylene (SRPE) CSO storage system was economical and practical. 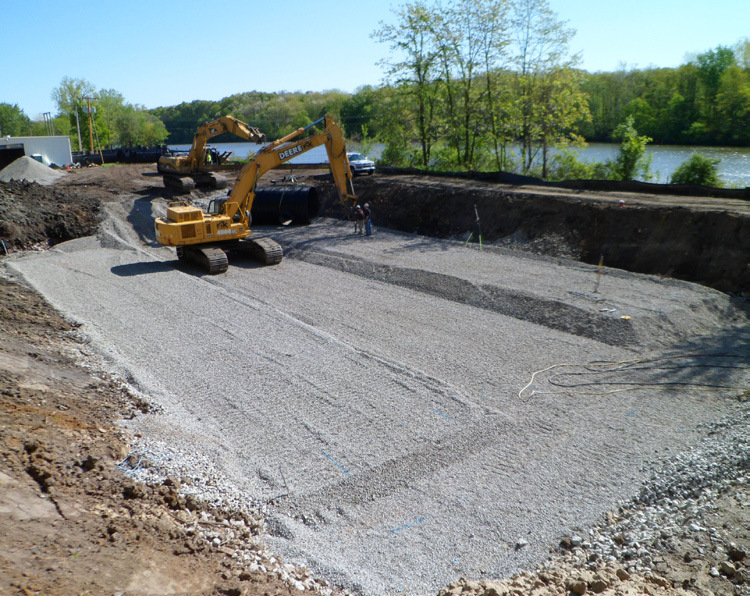 This optimal solution modeled an underground, high-performance storage system by using a grid of buried pipe to store combined sewage below grade. 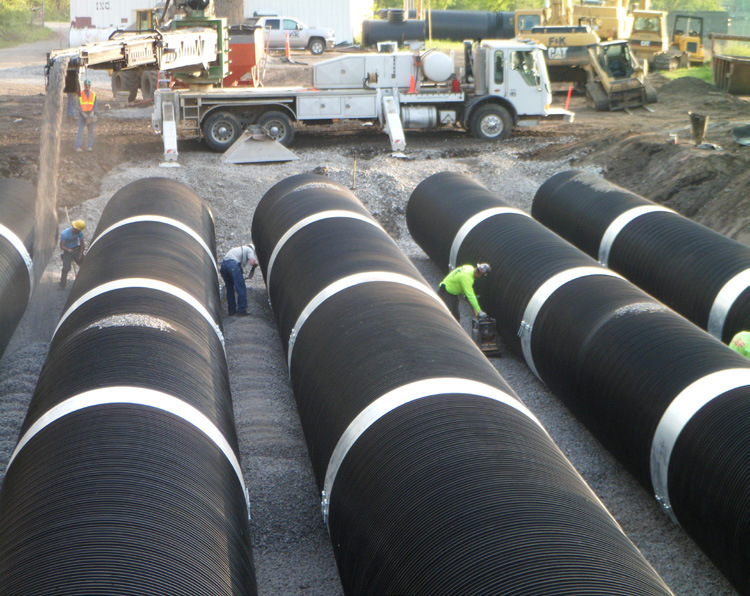 Contech’s DuroMaxx® SRPE technology was engineered into a CSO and drainage system that met the challenges of having a small footprint, water-tight joint performance and long-term durability. A 96-inch-diameter manifold pipe connected directly to the new wet well, above typical submersible pump-operating water depths to ensure normal dry weather flows did not backup into the storage structure. Six additional leader pipes slope down to the connected manifold pipe and have access risers at the higher ends to facilitate system flushing after wet weather events. During wet weather flows when the submersible pumps cannot keep up with incoming flows, the wet well backs up into the manifold and leader pipe matrix, capturing the “first flush” and eliminating CSOs from all but the most extreme conditions. After events, the pump station runs full speed until the storage is drained and the wet well level falls back to normal operating depths. This system has the advantages of a buried and out-of-sight tunnel, and boasts a low-depth profile that plays well into existing system hydraulics and high-water tables. The 80 ksi steel-reinforcing ribs with pressure rated polyethylene resin provide a strong and durable pipe, exactly what the City sought. 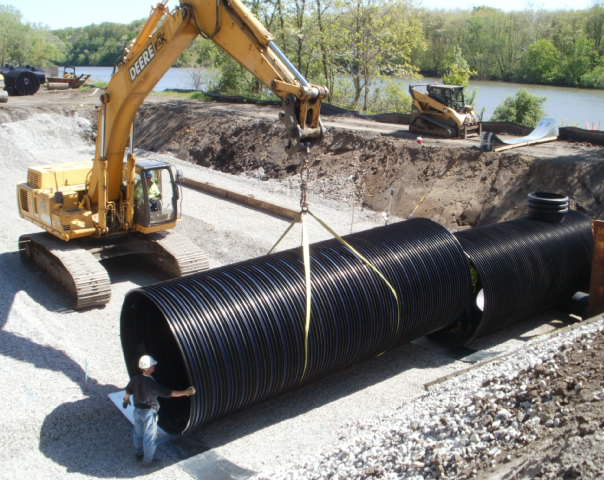 The ability to nest the varying-diameter SRPE pipe, coupled with the material’s lighter weight compared to alternate systems, also reduced the freight and installation costs. F&K Construction, the selected contractor, installed the grid of 96-in., 84-in. and 72-in. diameter SRPE pipe. Since DuroMaxx SRPE is lightweight, installation was quick, which meant less expense and fewer dewatering issues. Due to proximity to the Tippecanoe River and Lake Freeman, joints also were a concern. Electrofusion joints were used since each joint can be individually vacuum tested and they provide the water-tight protection needed. Additionally, since the DuroMaxx SRPE pipe has fewer joints to assemble on-site, installation schedules were favorable. With its smaller footprint than alternative systems, the SRPE pipe offered easier constructability and room for future expansion. Storage for 395,000 gallons was created during the Phase I configuration. In 2014 as part of Phase II of the project, the 96-inch manifold pipe is expected to be extended west approximately 25 feet and two more leader pipes will be added to expand the system to the full 500,000 gallons of storage volume indicated in the City’s LTCP.